Everyone can observe the fact of the phenomenons of stasis and change. As much as we know things appear in many ways to “stay the same,” we know things are also constantly and endlessly changing at the same time. My best friend from college and I recently heard a lecture online from David Chalmers, who is one of the leading philosophers on consciousness. During his lecture, Chalmers proposed what he called a “radical” idea that consciousness is fundamental, contrary to the common scientific view of consciousness being the product of some “thing” or material object like the brain. I was fascinated to hear this idea of consciousness being fundamental and universal in David Chalmers’ lecture, because at the time I had never before heard this idea articulated from anyone, except from my best friend from college. In talking this over with my best friend, we eventually came to develop a “theory of everything,” which began and essentially ended with the recognition that stasis is the same as consciousness, and that consciousness (or stasis), along with change, are the two fundamental principles of oneness. Stasis, by definition from the Greek means, “a standing still,” or a state of equilibrium and stability, while change is the exact opposite. However, the principles of stasis and change are two aspects of one, and not “separate” and “independent” principles of each other, because if they were “separate” and “independent” principles of each other, then one would cancel out the other, resulting in only nothingness, which is obviously false. The way we know stasis and change are principles, and not some relative “thing,” other “entity” or “being,” is because for all of the vast diversity of existence, it is only stasis and change that remain constant, with all things subject to both. Stasis and change are therefore fundamental, and being fundamental can therefore not themselves be relative “things” or “beings” subject to stasis and change, nor have a “beginning” or an “end,” as is the case with all things and beings that exist in the universe – including the brain. That is why if stasis, which is fundamental, is synonymous with consciousness, then all “material” explanations for consciousness are therefore ultimately incorrect. It is a great irony to contemplate the famous saying that change is “the only constant,” but this is only half true because stasis is also a constant since stasis, like change, is continually perceived in all things by our recognition of things appearing essentially “the same,” while observing change in these things at the same time, even if ever so subtly. Our ever-present observation of things appearing essentially “the same” (stasis), while also changing at the same time, is how we know these principles are a matter of fact. While scientists and philosophers tend to focus on the “hard problem” of consciousness, a term coined by David Chalmers to describe the question why any physical state is conscious rather than non-conscious, and some have even stated that consciousness is fundamental, I have never heard anyone directly address the equally “hard problem” of change – why change happens in everything we perceive. Even with sayings such as “change is the only constant,” I have never heard anyone speak with a true understanding that change is also fundamental, seemingly ignoring the other “side” of the fundamental question. Since stasis by definition is a state of equilibrium and stability, it is therefore one and the same as the phenomenons which manifest this appearance of stability, including structure, form, and order we perceive in the universe. This “organization” of structure, form, and order that is stasis is consciousness itself. Stasis is consciousness. The reason stasis is consciousness itself is because both stasis and consciousness do the exact same thing – they organize. The deductive reasoning which demonstrates this is as follows. Stasis, order, structure, form, and information, are different words which are synonymous with organizing. Consciousness organizes. This is the very nature of consciousness. Since stasis and consciousness both equal organizing, then stasis and consciousness are therefore one and the same. Another simple way to express this is as follows. We can also more specifically express it this way. A (stasis) is equal to C (organizing). B (consciousness) is equal to C (organizing). A (stasis) and B (consciousness) are both equal to C (organizing), and are therefore one and the same. For purposes of convenience, when I use the words “stasis” and “consciousness” throughout this writing, I am using these terms interchangeably since they are one and the same. While David Chalmers considers the possibility of consciousness being fundamental, it is clear from his language in speaking of whether or not things “are conscious,” he still sees consciousness in dualistic terms as some separate quality something “has,” rather than seeing everything as consciousness itself – one and undivided. Notice I did not say that everything is conscious, but rather that everything is consciousness itself. I say “itself” when referring to consciousness sometimes for convenience of speaking, but since consciousness is not a “thing,” then consciousness cannot truly be an “it” per say. It is not a question of whether or not something is conscious, it is a question of what is consciousness? Once it is understood that everything is consciousness, then the question of whether or not something is conscious becomes meaningless. Since consciousness and change are fundamental, they are therefore universal, and not individual. This therefore invalidates the idea of “personal consciousness,” or notions for the eternal “soul” or “spirit” of the individual, as many spiritualists such as Deepak Chopra attempt to claim in light of science’s failure to explain consciousness. What we call “personal consciousness,” or our notions of “me,” of “self,” is not really “consciousness” as defined here as synonymous with stasis, but is more accurately defined as self-consciousness, which is the result of thoughts and observations arising within the brain about the body of the organism it occupies, as well as that which exists outside the body of the organism it occupies, which produce our notions of “self-awareness” as separate from “other” – the ego. The physicality of our “selves” is clearly evident in how personality, ability, and character can be altered by brain damage, degenerative diseases such as Alzheimer’s, as well as substances like drugs and alcohol. If our “selves” or “souls” were “spiritual” and not physical, then changes to the brain could not also produce changes in qualities in ourselves considered the domain of the “soul” such as personality and character, but we know as a matter of fact that changes in the brain can and do just that. Since the notion of consciousness being fundamental and universal is therefore immeasurable and nonlocal, this probably explains why many scientists have not taken the notion of consciousness (stasis) being fundamental seriously, despite its incredible explanatory power to render the “hard problem” of consciousness not a problem at all. For if consciousness is fundamental and therefore universal, it is therefore not some “thing” or “force” which can be measured by usual scientific means, and therefore not able to be “proven” with mathematical “formulas” or by any of the conventional measurements of science. Since science is about what can be measured, along with its formulas and mathematical, empirical data to either falsify or validate a claim or a theory, and we are talking about the immeasurable – the effects of which we can only observe, and never technically “prove,” then scientists have most likely shied away from the idea of consciousness being fundamental for fear of losing credibility by positing unscientific “woo” or some “spiritual” implications for existence. However, the idea of consciousness being fundamental need not be considered “spooky” as some like to describe difficult to understand suppositions, nor “woo,” nor “spiritual” in terms of positing some “non-material substance,” “dimension,” or agent which somehow acts on and affects the material, phenomenal universe at the same time, which is a contradiction. That is not at all what I am positing. I am positing there are fundamental principles of stasis and change, which being fundamental therefore cannot be “separate” and “independent” “substances” or “agents” from existence itself since all is one. In other words, there is no separation between an apparent “subject” and “actions” pertaining to that apparent subject – no true separation between “nouns” and “verbs.” All is one. The problem with the common scientific explanation of the brain being the “source” of consciousness, is the fact that since the brain is in some ways fixed, while constantly changing at the same time, it too is subject to the principles of stasis (consciousness) and change, and is therefore not fundamental, and therefore cannot be the “source” of consciousness. The philosophical advantage to positing that consciousness is fundamental, rather than a “product” or a process of some “thing,” material object, or “being,” is it solves the “hard problem” of consciousness as stated previously. This “hard” problem for “why” consciousness, or “why” something or some being is conscious, is one which has still to this day not been solved by modern scientists for over a century from a purely reductionist, materialist worldview. Joseph Levine argues that closing the “explanatory gap” between consciousness and the physical is the hard problem. However, the problem is solved, and the question for “why consciousness” is rendered invalid if consciousness is fundamental and universal, which would therefore mean there is no separation between consciousness and the physical, because everything is consciousness itself, as stated previously, with varying abilities of conscious perception depending on varying nervous systems, brain size and complexity, etc., of the physical system. The philosophical advantage to positing that change is also fundamental, is it also solves the “hard problem” of the ever-present fact of change – the “other side” if you will of the fundamental question. The very fundamental question “why” things appear to remain “the same,” while constantly changing at the same time, is answered if stasis and change are fundamental, and therefore universal and immaterial, while these questions have never been sufficiently answered by a purely reductionist, materialist explanation. While this theory cannot be scientifically “proven,” it does hold up to sound reasoning, and is perhaps the most logical, non-contradictory, and reasonable explanation for reality. The reason why the question of consciousness is probably best answered by philosophers instead of scientists is because the immeasurable is by its very nature beyond the limits of measurable scientific means of explanation. That being said, the Nobel Prize-winning German physicist and the father of quantum theory, Max Planck, who lived from 1858-1947, understood the fundamental nature of consciousness as clearly expressed in his own words. It is baffling to me why so many physicists and other great thinkers have failed to take seriously and acknowledge the profound implications of Max Planck’s astounding and logically sound reasoning and explanatory power of his understanding of consciousness as fundamental from back in 1931. Even Albert Einstein, one of the smartest and most influential scientists in history, who was discovered by Planck, and was looking to prove a unified field theory built on materialism, was unable to do so. Einstein admitted his failure in his own words in October of 1954. Again, the inability to scientifically measure and therefore create formulas or equations to “prove” consciousness itself is what has probably kept many scientists away from Planck’s notion of consciousness being fundamental. While I have heard several great thinkers scoff at this idea of matter being a derivative of consciousness – an idea proposed by none other than the Nobel Prize-winning father of quantum theory, this idea is now being supported by research in modern science, and in particular by a recent experiment conducted by researchers at Australian National University, and published in the journal Nature Physics, which essentially shows that reality does not actually exist until it is measured – at atomic scales, at least, and that at the quantum level, reality does not exist if it is not being observed. Does this mean if I do not gaze at the moon it therefore does not exist? No, because again, this is the observation of things at the quantum level, which means as I understand it, consciousness itself is the “observer” if you will, while the action of observation is change. What else if not consciousness itself could “observe” and “measure” if you will, in order to bring about the existence of the universe if it had a “beginning,” and all that exists within it? It cannot be only human observation and measurement, because if that were the case then the universe would have never come into being until human beings were around to oberserve it, which is logically unsound and therefore incoherent, not to mention egocentric. I have never heard a single scientist, including those who support the simulation hypothesis for reality state the universe did not exist until human beings or any other beings were there to observe it. The “observer” if you will, must therefore be no “being” nor “thing,” but rather that which is essential – consciousness itself. So in a nutshell, when consciousness changes, or “observes” and “measures,” there is the apparent emergence of observable forms – the very act of what we would call “creation.” This theory is compatible with the fact that most physicists now accept that particles do not exist as objects in the absence of observation, but exist only as waves, which then form into particles when observed, as demonstrated by modern double-slit experiments. These waves are intangible potentialities rather than actual things. In other words, there is only potential in the form of waves, which only when observed then becomes tangible reality, or “stuff” if you will. Werner Heisenberg understood this fact as illustrated in the following quote. Our world appears to be pixelated like a simulation of consciousness that assumes definite form when observed. While this might seem a radical idea, it is an idea which is increasingly gaining traction in light of modern double-slit experiments which shows that light and matter can display characteristics of both classically defined waves and particles. According to this “theory of everything” as developed by my friend and I, the beginningless and endless interplay of the fundamental principles of stasis and change are ultimately responsible for energy. Therefore, quantum fluctuations, which are the appearance and disappearance of pockets of energy out of empty space, also occur in this theory as the result of the principle of change. There are the two fundamental principles of the static and the dynamic. The static is consciousness, which is synonymous with stasis, structure, order. Consciousness is the principle of stasis, as stated previously. We only perceive “stuff” because of the principle of change. Change “creates” the “stuff” which we observe and experience every day – the “material world,” which is energy. Said another way, change “creates” distinction – the various specific forms of the material. The “stuff” that we see are the imbalances within oneness. “Stuff” is “polarized,” if you will, by the principle of change which “creates” imbalance, creating “positive stuff” and “negative stuff.” This is the perfectly equal positive and negative “sides” to energy. This “negative side” to energy is gravity. Observable matter and gravity represent these two “sides” to energy. The imbalances created by the principle of change is always within the change of the “stuff,” but the “stuff,” amidst the change is still one and whole. Nothing in fact is ever truly “created,” but is simply the manifestation of the endless “rearrangement” of energy into unique manifestations resulting from these imbalances due to the principle of change. The appearance of duality, or relativity, is due to change which creates imbalance within the “stuff.” This results in constant fluctuations, like a wave. Below is my illustration of a visual representation of this phenomenon. As we can see in the illustration above, this image of a circle – without beginning and without end – represents a single whole – with nothing “outside” of it because it represents ALL, with two “sides” of energy within the circle – ALL. The interplay of the principles of stasis and change “creates” these two “sides” of energy, with the black and white waves in my illustration representing both the “positive” and “negative” “sides” to energy respectively. 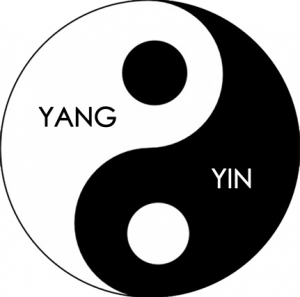 This is brilliantly illustrated by the Chinese yin and yang symbol, with one side in black, and the other in white, representing the perfectly equal “positive” and “negative” “sides” of a single whole. The yin and yang symbol is in my opinion, the most accurate religious symbol I have ever seen of Reality – of oneness and its two principles. The wave of the yin and yang symbol is also very significant. Instead of the two halves being illustrated by a line down the middle cutting the circle in half, it is instead illustrated by a wave. In my visual representation of oneness, and the two principles of oneness above, I also use the image of a wave to represent the wavelike change within oneness, which creates both the “positive” and “negative” “sides” to energy. We perceive the universe as expanding. What we are perceiving is the “macro-wave” if you will, trending towards equilibrium. Time appears to “move forward” because of this trending towards equilibrium. Words are so limited because we are not talking about actual “movement” because nothing is going anywhere because “space-time,” or the perception of space-time is created by the principles of stasis and change themselves. Time is ultimately an illusion because time is nothing more than our measurement of change. Change is real, but our measurement of it creates the illusion of what we call “time.” Space is ultimately an illusion as well, because space is nothing more than our measurement of stasis. Stasis is also real, but our measurement of its manifestation in apparently “fixed” forms creates the illusion of what we call “space.” Ultimately time and space are the same illusion, and not separate illusions, since “time” requires the perception of change on form, and “space” requires the perception of form that emerges from change. This clearly illustrates the fact that stasis (form), and change are simply two sides of the same one coin. One could never be without the other, because the very presence of one demands the other. Contrary to the view of most scientists, time and space are not fundamental because again, space-time is created by the very principles of stasis and change themselves. That is why stasis and change are fundamental – not the measurement of that which is the result of their beginningless and endless interplay – space-time. Beyond equilibrium, the trend is towards the point of absolute imbalance. As the macro-wave trends towards absolute imbalance, time effectively reverses. However, it’s unlikely one would perceive time being reversed, as perception would also be reversed. In other words, from the point of view of consciousness, there is no difference between compression and rarefaction – or trending towards equilibrium or absolute imbalance. Absolute imbalance is the “big bang” and the “big crunch” at the same time. What is in theory equilibrium is the speed of light. When the trending at the quantum level reaches the speed of light, the universe is in equilibrium. Beyond equilibrium, the rate of contraction would appear to slow to the point as if it would never reach absolute imbalance. The reason we perceive “stuff” in the universe is because of the imbalances “created” by change, as stated previously. Every manifested thing represents an imbalance. “Things exist” because there is the “non-existent” simultaneously, like a displaced wave. This “non-existent” is also known as gravity, as represented by the “negative side” of energy shown in black waves in my illustration above. The principle of change “creates existence” if you will – the emergence of observable forms, which is represented by the “positive side” of energy shown in white waves in my illustration above. This phenomenon can also be observed in the fact that most physicists, including Stephen Hawking, think there is zero total energy in the universe. While this might seem impossible because our manifested forms appear to confirm there is only “positive” energy in the universe, and not zero, there is a “positive side,” of energy, or what we can see, as well as an equally “negative” side of energy, or what we cannot see, like mirror images of each other, as we also discovered earlier – perfectly illustrated by the Chinese yin and yang symbol. This “other side” of energy we cannot see is simply gravity – that which holds all forms together, and not to be confused with the dualistic notion of the “spiritual world” as separate and distinct from the “material world.” Because we have existence, these two “sides” of energy must be one – like two sides of the same one coin, and not separate and “independent” realities as purported by Descartes’ idea of substance dualism, because if that were the case, then one would cancel out the other, and existence would not be possible, as stated previously, and especially in the post, “Contradictions and Double-Standards.” Two opposite, separate, and independent realities such as the “spiritual” and the “material” can only result in nothingness, which is obviously false. This is perfectly represented by the simple math problem 1 – 1 = 0. That is why all dualistic notions of separate and independent realities such as the “material” and the “spiritual” are false – because the very idea of dualism itself is a contradiction. All is always One. While things are in a state of imbalance in the apparent dualistic “relative” material world as a result of these constant fluctuations resulting from the principle of change, there is still always perfect balance overall in the Oneness of the universe, because the precise amount of matter and gravity is always exactly the same. There are those who have tried to posit that things in the quantum realm operates by a separate set of rules that don’t apply to the macro world of our daily experience. This idea is known as “marcorealism.” However, macro-reality has been repeatedly demonstrated in experiments to emerge from quantum-reality, so the two cannot be separated. Reality is all emerging from the same source – what I would call consciousness, and operates by the same rules at all levels. This validates scientifically what was stated previously about the universe being a single whole from which all things emerge, and therefore cannot be comprised of “separate” and “independent” “realities” that play by different rules as posited by the notions of “substance dualism” between the “material” and the “spiritual.” As of February 2015, macrorealism has failed every single experimental test. At this point, one might say, “Okay. Great. You’ve explained the workings of All at the fundamental level. You’ve explained that there is oneness, and there are two principles of oneness – stasis and change. Who or what is responsible for these principles? Why are these principles even in play at all?” This is essentially the “why something rather than nothing” question many theists like to ask in an attempt to “prove” it must be God who is behind all of this, and my answer to that question is that it is unanswerable. The atheist wants to say, “there is no God,” and the theist wants to say, “there is a God.” Both are incorrect because neither statement can be made with absolute certainty. We could say it is “God,” which is the “reason” behind the principles of consciousness and change, or the popular “New Age” conception that God is consciousness itself, but this “God” would have no resemblance whatsoever to the traditional ego-centric conceptions of God as an eternal, omnipotent, omniscient, omnibenevolent being who judges and rewards because as we have discovered before, all egocentric conceptions are false, like “round squares.” Furthermore, the principles of consciousness and change are indifferent, precisely because they are principles, and are therefore not a “being” with a “will,” a “plan” or a “purpose.” They therefore don’t “care” about us or “not care” about us. They simply are. This obviously bears no resemblance whatsoever to the Judeo-Christian, egocentric conceptions of a so-called “personal” God. The problem for theists and indeed for most everyone is our tendency to “egotize” things – to assign “responsibility” for and “ownership” of things and phenomena to some “being” or “entity.” Our own egotism is responsible for this tendency, as well as our tendency towards concrete thought rather than abstract thought, but that does not mean we can assume agency – that “beings” or “entities” are responsible for our life circumstances, whether we say it is “God,” “Satan,” or any other “being.” Since our emotions and not our logic are primarily responsible for what we tend to believe and how we tend to behave, then it is natural we would prefer to believe “beings” or “entities” are “responsible” for what happens in our lives. That is much more emotionally satisfying than to realize the impersonal and indifferent principles of stasis and change are ultimately responsible for the totality of our existence. It is no wonder why human beings create God. While we can most definitely disprove the traditional Judeo-Christian and all egocentric conceptions of God, because the truth of egolessness invalidates these concepts automatically, we cannot answer the ultimate question why the principles are in play in the first place, any more than we can answer the question why anything exists at all. The question is therefore irrelevant, as it is unknowable. That is why the idea of an “uncaused cause,” otherwise known as the cosmological argument for the existence of God, does not work. Belief in an “uncaused cause” relies on false assumptions – the assumption of the separateness and independence between “cause” and “effect,” and the assumption that everything requires a cause except for the “first cause,” which is a contradiction. To apply a double-standard to make the “uncaused cause” argument “work” is invalid because as we have discovered before, all contradictions and double-standards are false, like “round squares.” The common “logic” for why some believe in the need for an “uncaused cause,” comes from the perception of the supposed “infinite regression problem,” which states there cannot be an infinite regression of causes, which therefore means there must ultimately be a “first cause,” which theists say is God. What those who believe in this theory fail to see is the fact there is no “infinite regression problem” to begin with because there can be no beginning and no end. Some physicists such as Sean Carroll believe the universe is eternal – that it never had a beginning, nor will it ever have an end. I find this idea very logically plausible, and do not see why it could not be true, but even if we say the universe did have a “beginning” with a “big bang,” there still had to have been something before that because something cannot come from nothing, as such a notion is a logical contradiction, as we have also discovered before. If we buy in to the illusion of time, and the notion of “beginnings” and “endings,” then we can see no other alternative but an eventual “infinite regression problem,” concluding there must be a “first” and “uncaused cause.” But if we see that time and separateness are an illusion, and if we see there is no beginning and no end – only endless manifestations of stasis and change of the same inseparable One, with a potentially infinite number of “big bangs” taking place over the course of infinity, “breathing” if you will like a wave of contraction with the “inhale” of the “big crunch,” followed by a wave of expansion with the “exhale” of the “big bang,” then there is no “infinite regression problem” whatsoever, requiring no “outside cause” for the Whole of stasis and change. 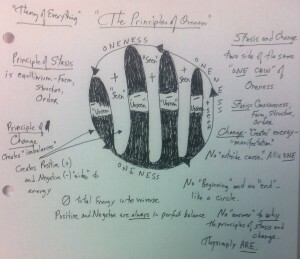 While Christian theology assumes reality to be linear, with a “beginning” and an “end,” or as some might put it, a “beginning” with no “end” created by an “outside cause,” non-contradictory logic shows reality to instead be a cycle of infinite self-contained causality, like a circle, with no “outside cause” for it whatsoever. The reason there can be no “outside cause” is because all concepts of “outside” and “inside” ultimately do not exist because nothing is ever separate from ALL since all is truly One – a single WHOLE, with the two principles of stasis and change that have always been and will forever be. The principles were never created, because the principles themselves, unlike the concept of God, are not a thing, nor a being, never separate from anything since they are the very essence of everything, and are therefore not relative, as we discovered before. Because the principles are not relative, they therefore never began, and will never end. This is the only view of reality that does not contradict itself. Notice how in the symbol below of the Christian cross, it consists of two lines, reflecting the Christian view of reality as being linear, with a beginning and an end, instead of a circle like the yin and yang symbol, with no beginning and no end. While the Christian cross well represents the fact of the two aspects of oneness, joined at the cross-point, they are still separate lines – reflecting the complete opposite of oneness, and instead illustrate the concept of essential dualism, or the notion of “separate” and “independent” realities, which is false, as stated previously. It is false to assume there must be an “answer” to the unanswerable question why the principles of stasis and change are in play in the first place. It is incorrect to assume there must be an answer to the question of why. Many theists and atheists alike insist there must be an “answer” to this question, as if the “answer” is a principle in and of itself, but there does not necessarily have to be a “why” at all. Besides, any “answer” we give to the question of “why” can only be made within the limits of relative consciousness. The problem is, the questions we are asking – why consciousness, why change, why existence at all, are unanswerable questions because they are beyond the limits of relative consciousness. All questions of “why” are relative questions. The Oneness of All is not relative, since it is ALL. Therefore, the question of “why” Oneness and its principles of stasis and change are in play in the first place is ultimately meaningless, because it is unknowable. The real question is, can we live without an answer – and live with the eternally open question of “why existence,” or do we need to invent answers to close the question? The one thing we can be sure of, is the question must always remain an open one, and ultimately an irrelevant one, because the “why” of existence is ultimately unknowable.